This is where I'll toss out some of my crazy ideas that are relatively smaller and don't really need individual threads. Continue the Blue Line connection at MGH under the Charles to a junction somewhere near Kendall. Put a junction north of Broadway, South of Maverick, and connect them. And there you have it, my Red Line Wye, also featuring a new stop for the Financial District and Downtown Waterfront located below the RKG between International Place and Rowes Wharf. Will also feature a free ferry transfer. Oh, and the Maverick-Broadway portion will run to Ashmont only, not Braintree. And that would cover all Ashmont service. This is an attempt to keep Braintree riders from getting pissy like they do about everything. Coming soon to a Google Map near you! The Green Line Wye! Featuring heavy rail upgrades to the central subway and a wye connection to the Blue Line in the Government Center/State Street/Park Street area. After that one, I'm all done with wyes [I think]. Except I rename her... The Blue Line Wye. The Green Line would be upgraded to handle current Blue Line rolling stock. The curve from North Station to the viaduct portal would have to be straightened out, Haymarket would be eliminated due to new alignment to account for the curve coming in from State, and that would be covered by a new Government Center station on the north side of the wye. Also, Boylston would have to be relocated, if not eliminated, due to curve. I like the ideas of connecting more lines together but I think it might be better accomplished via completely separated, dedicated lines. Here's my crazy idea that kind of rethinks the entire way the T is organized now, based on Madrid's Metro. A rough sketch, but you get the idea. You guys mind if I post these on futureMBTA? Full credit of course. Doesn't bother me either. I will probably be tweaking it a bit though. Sounds fine, no qualms here. Van...I LOVE your maps. Not just like...but LOVE! 1. The Red Line will be extended out to 128/Brandeis. It'll take some time, and a lot of litigation from NIMBY's. But it'll run alongside the Commuter Rail, which will be okay with most neighbors. The worst will be that they'll just add a commuter rail stop at Alewife. 2. The Orange Line will be extended to Dedham. The Northwest End will unfortunately say the same. 3. Boylston and Hynes Stations will be rebuilt by the year 2020. While the Concrete will be reinforced in the tunnels. 4. The Blue Line will be extended to Lynn. 5. The Red/Blue line connectord to MGH will happen. And who knows? Maybe I will be wrong. Hopefully I'll be wrong (or right, depending on where you stand). But in Mass, we need to take baby steps. We also can't be trusted with elaborate projects. 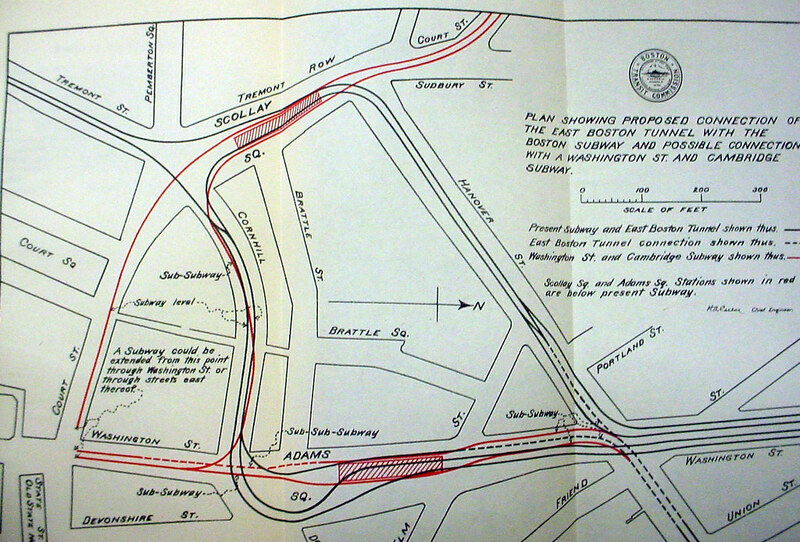 This is very similar to an early proposal for the original Tremont St subway and the East Boston tunnel. The wacky original layout of Scollay and Adams Sq stations was to act as a kind of interchange for trains coming from the north, east (via the East Boston tunnel), south, and west (via Cambridge St). I think once the subway became popular there was a push towards full heavy rail which killed the idea. Here is a map I found once, year unknown. Edit: Your posts are up, thanks a lot! Great ideas. Given that maybe 5% of what's proposed actually happens, and there haven't been serious proposals floated for the first three of these, I give only the last two any remotely serious chance. The T seems to have a sexual fixation with the idea of BRT. Now, I don?t really have anything against BRT, it?s just, if you are gonna spend billions of dollars, try to build something that will last. I think that the Urban Ring should have two subway routes rather than one. One route will come close to the city and the other will be further out, near Harvard. The first route is basically what the MBTA proposes but will connect to Logan rather stopping at Sullivan. It will go from Logan Airport, connect with the Blue Line at Wood Island, follow the Grand Junction RR in Chelsea and Everett, and cross the Mystic to Sullivan Sq. Then it heads south to Lechmere and Kendall. After Kendall it will follow the Grand Junction a bit further and dive under the Charles River to Kenmore Sq. It will travel under Brookline Ave to the Longwood Medical Area where it will make a sharp turn west to Huntington Ave and Ruggles. Here it will head southwest to Dudley Sq, over to Uphams Corner, the current JFK/UMass stop (which will have its name changed back to Columbia, or Expo Center) and finally out to UMass Boston. The second line will leave from Medford Center, heading west were it will meet up and run parallel with the Orange Line to Sullivan Sq. Here it will sharply turn east and meet up with the two branches of the Green Line on Washington St and Union Sq in Somerville. It will head southeast to Inman Sq in Cambridge where it will make another sharp turn to the east and head to Harvard Sq. At Harvard it will travel under to Charles over to Allston where Harvard University is building its huge student campus. The line will head south under Franklin St, connect with a new Allston commuter rail stop where the Sports Depot is and continue under Harvard Ave, stopping at Comm. Ave and Coolidge Corner. At Coolidge Corner the line will head west and connect with the first line in the Longwood Medical Area. That refresh your memory? I think this idea for an Urban Ring works perfectly. Maybe we can get an acclaimed architect like Norman Foster to design the stations, like he did with the Bilbao Metro. That was my old, heavy rail, plan for the urban ring. I've since changed gears and now think that building light rail subway network which integrates with the Green Line would be a better plan. I don't know if I ever actually wrote out the specifics but it would allow for not one but up to 3 different "loops" through Boston, Roxbury, and Cambridge. When I get home and can look up what I have I'll post it. I personally thought it was a much more ingenious idea than what the T was proposing; one which could easily be built in stages and be affordable. Given the way ideas get watered down in Boston we should have begun conceiving of the Urban Ring as a high-speed maglev. Then we might have wound up with, at least, light rail! As it is the MBTA started with heavy rail and we're going to wind up with a shuttle bus sporting a handmade sign taped to the window. And it won't run weekends or holidays. that is honestly absurd/embarrassing. They couldn't have gone for full coach buses (especially considering they are still charging upwards of $4.50 for a ticket. Touche...*sigh* I guess that any progress is good progress. Heavy rail should be good. Light rail should be on the streets. Green line Should go heavy. West Medford to Riverside via Central Subway, Huntington Avenue E Line, and then a connection to the D Line to Riverside. Of course, ideally, we'd instead temporarily replace the Green Line with a Blue Line heavy rail extension past Bowdoin to, say, Kenmore...but that obviously seems less likely. I couldn't believe it when I and the other passengers were herded onto these things at Forest Hills. Most of these people are wearing suits and typing on Blackberries. There was a distinguished old woman with expensive luggage and a cape (cape!) who exclaimed "ooh! what an adventure!" I wonder how she'll feel after doing this for months. I'm glad I don't have to make this journey every day; they're running these buses on every journey outside rush hour until almost the end of the year. Rush hour trips haven't been left unscathed either; trackwork has increased the time it takes to run the journey from about half an hour to an hour and a half. I mean, I understand that there's track maintenance to do (and slippery rail this time of year) but think of the treatment that highways get: most scheduled roadwork is done in the middle of the night.